The following tutorial aims at transforming your photos into professionally looking images using free software only. 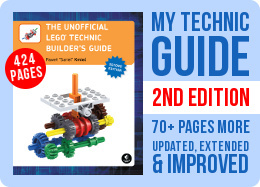 It covers basic tips on taking and processing photos, with focus on the latter. It should be considered basic/pre-intermediate level: a person with a good knowledge on graphic programs will learn little; a complete beginner should be able to master all of the tasks listed earlier. My goal was to make it useful to readers who have never worked on their photos in any graphic program, therefore it requires no knowledge on such programs and it consists of simple, extensively explained steps. 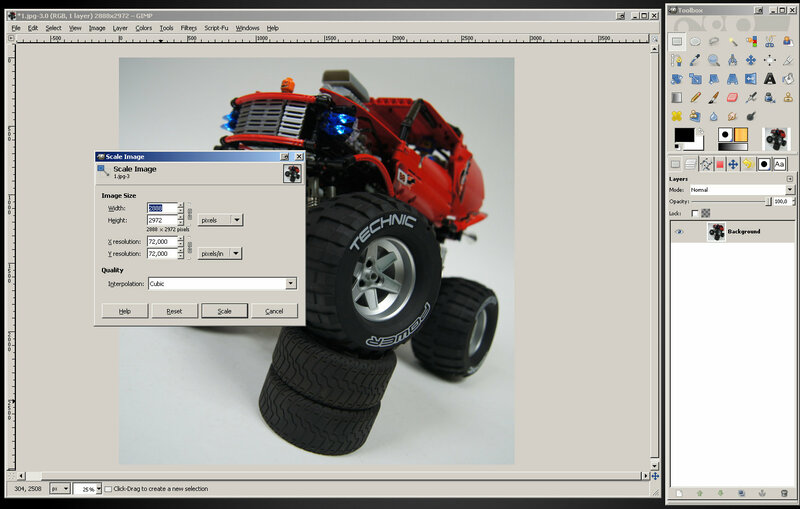 The tutorial makes use of the GIMP (GNU Image Manipulation Program): a free image manipulation software available for Windows, Mac OS and Linux at no charge. There are several reasons for choosing that particular software, and they are discussed in section 2, along with the installation & configuration instruction. Please note that the GIMP is in fact quite a powerful tool, in some areas almost as powerful as the Adobe Photoshop, and we will be using only a small fraction of its abilities. These abilities, however, are sufficient to make a transformation just as the one shown in this tutorial’s opening picture, and I hope that once mastered, they can become your basis for further experiments. The GIMP 2.6.11 was used for this tutorial. Please note that all the images in this tutorial are thumbnails that open up at full size upon clicking, and they should be viewed at full size. Finally, note that some parts of text in the tutorial are marked with bold font. These are instructions for actions we will be using often. Photography is a vast subject itself, so I will only put a couple of tips here. How your photos will turn out depends basically on two things: what you take them with and how. Backdrop! Try to take photos of your construction with plain white material behind, and preferably also below it. It will make your photo brighter, cleaner and it will even decrease its weight. Your construction won’t get much attention if there’s a pile of clothes and half of your desk next to it on the photo; but by using background you can easily make it the only object on the photo. Additionally, as the white surfaces reflect light, your construction will appear well-lit.A very good solution for a backdrop is a large sheet of plain white paper folded to cover both the background and the ‘floor’ of your photo. Personally, I’m using 10 x 2 meters paper roll which works extraordinarily well, but small constructions don’t need anything that big. 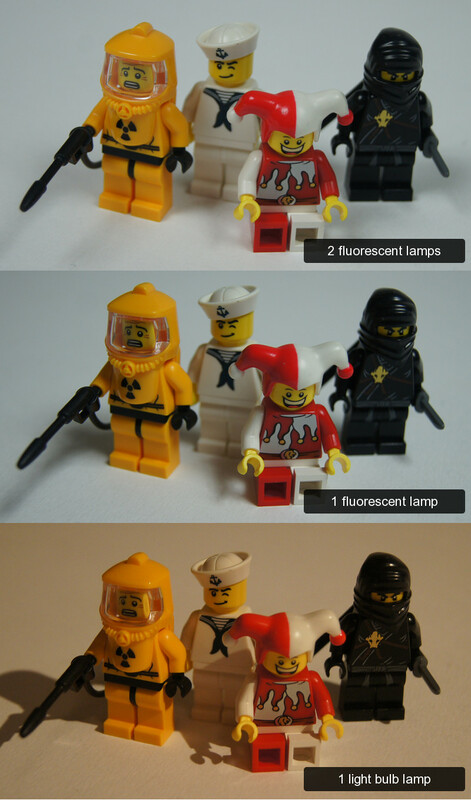 For example, when taking photos of a couple of minifigs, you should be able to do the job with a couple of paper sheets. A regular sheet from your bed is also an option, but it won’t work as well as paper because it’s not that smooth (the texture of the fabric can be visible on the photo), and it’s harder to keep it perfectly flat. Choosing the right lamps is important as well. It’s best if your lamps provide bright white (not yellowish) light and if their height can be easily adjusted. There is a wide choice of special studio lamps that can do that, but you don’t have to look that far: a good quality desk lamps with something else than a classic old-type light bulb (preferably a modern fluorescent lamp) can give surprisingly good results. As for me, I’m using a pair of studio lamps with Philips Tornado 23W fluorescent lamps, which are energy-saving and provide daylight-like light, and the lamps themselves can be folded and transported easily, their height is adjustable within an impressive range, and they have reflective umbrellas that help to use the light more efficiently. Their only disadvantage is the heat they create. As you see, the lower photo, taken with a flash, can initially impress with vivid colour. But if you look closer, you will notice that the objects close to the camera are too bright (e.g. 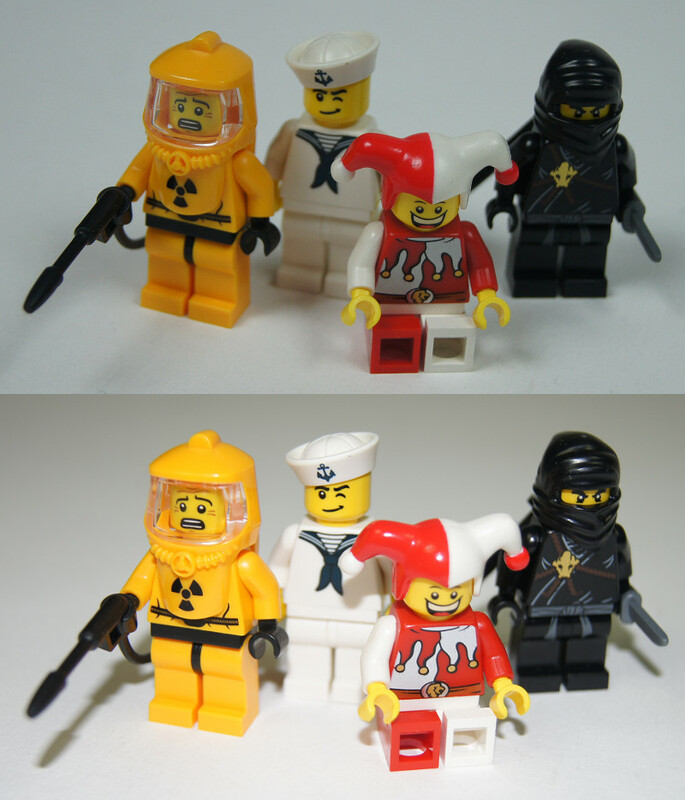 jester’s legs), the objects far from camera are too dark (the backdrop) and that the colours look wrong (it’s hard to tell the yellow face of the first minifig on the left from his orange suit). Finally, make sure your camera is set to save photo files in highest standard possible. High-end cameras can save photos in JPG + RAW format – this will be redundant for us. The JPG format set for top quality/lowest compression will be enough. We will get back to the JPG format in section 5. 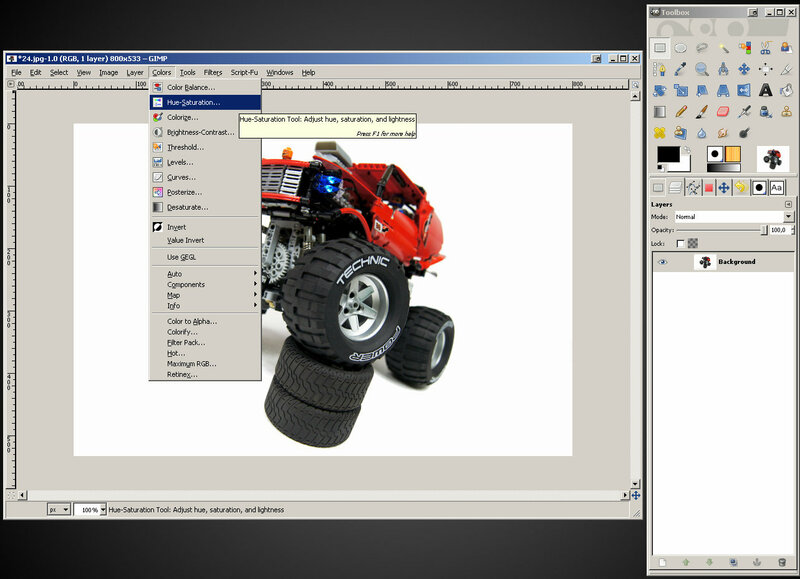 As mentioned earlier, we will be using the GIMP (GNU Image Manipulation Program) software. 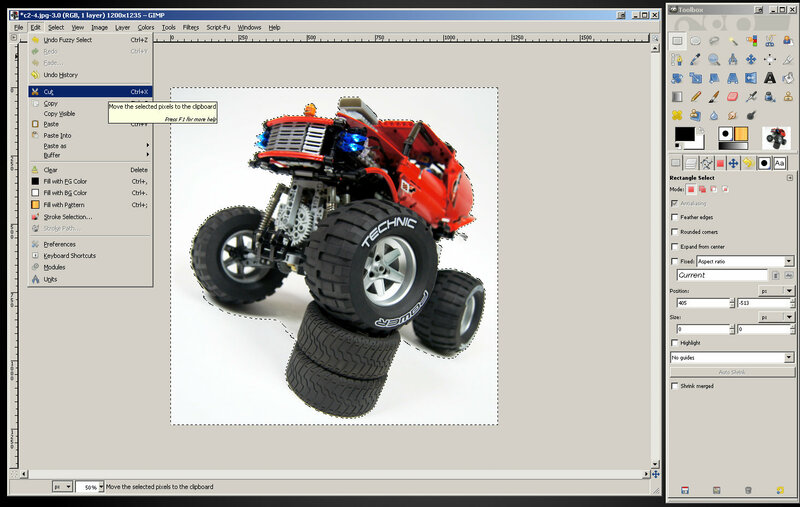 It is a free image manipulation tool available for many platforms in many languages and it offers majority of the Adobe Photoshop’s abilities at no charge. 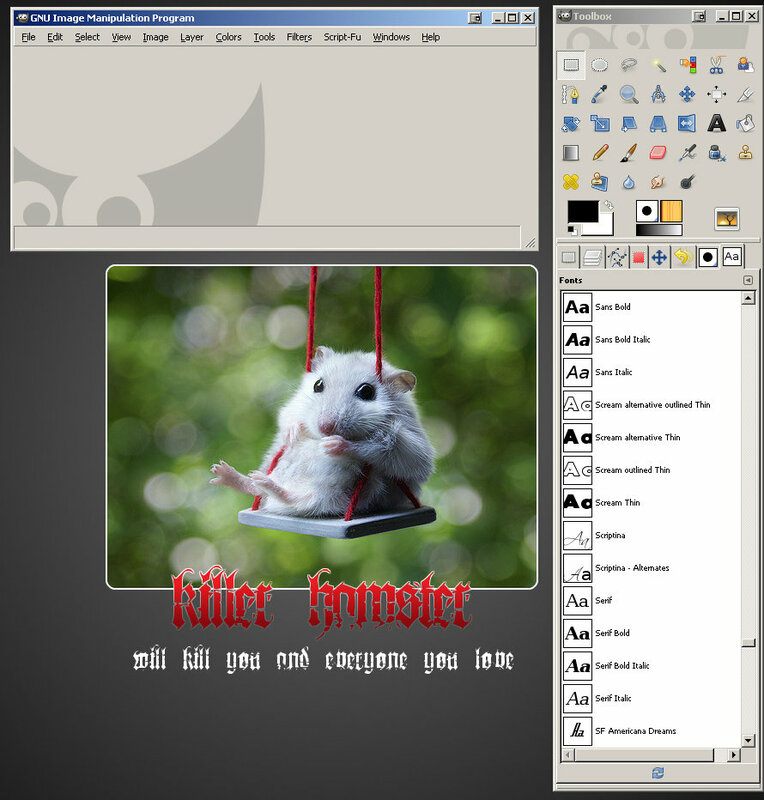 The GIMP can be downloaded from here. 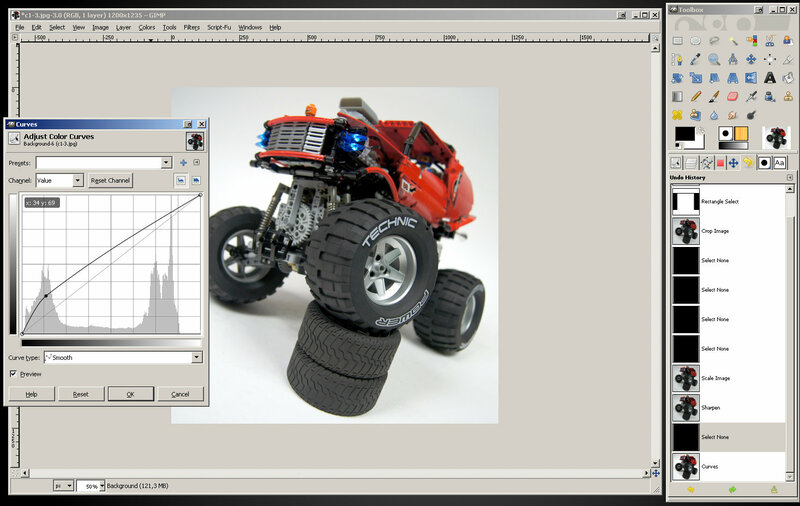 Why GIMP? First: it’s 100% free. While the Adobe Photoshop is the unquestionable leader among 2D image manipulation programs, it’s expensive and there are plenty of tutorials already available for it. Second: it’s available for all major platforms, in most major languages. Finally, it supports the Photoshop file format – it can read and create PSD files, although it omits certain data (such as editable text). 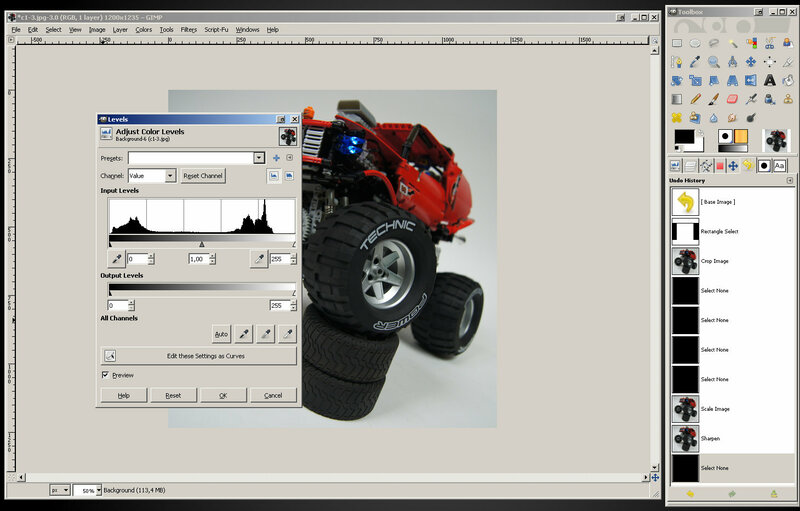 The following tutorial will be using the GIMP 2.6.11 in English version, and it is recommended to install this or newer version. Versions in other languages should only differ with text; newer versions should differ little. 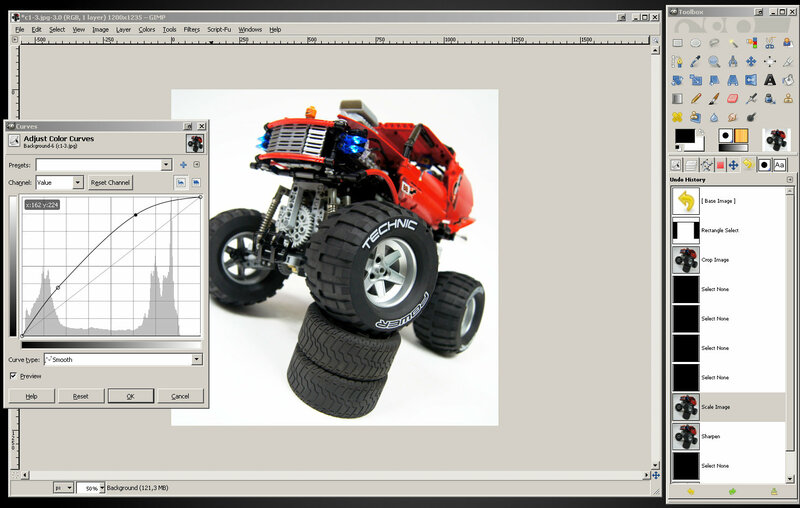 There have been no dramatic changes in GIMP’s development over the past few years, and if such changes occur in the future, I will do my best to update the tutorial. 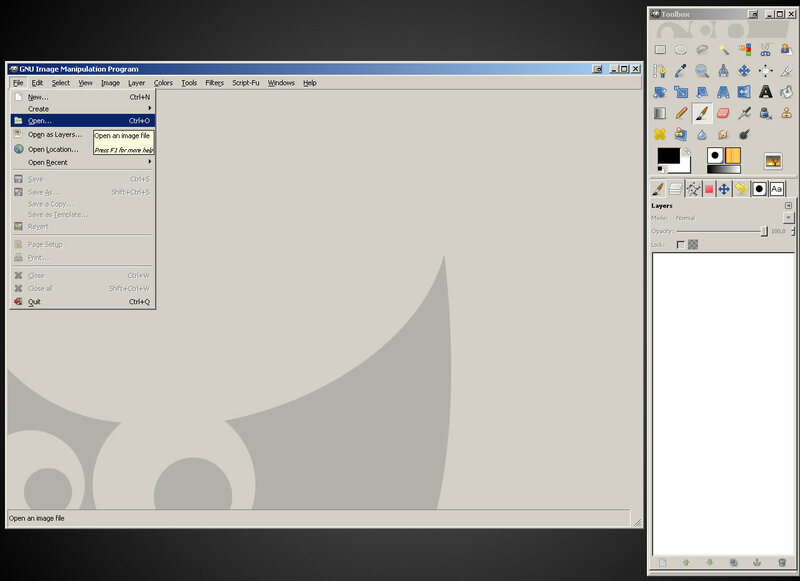 Once you download the GIMP, the installation is really straightforward. There is a very good help section at the GIMP website to which you can refer. 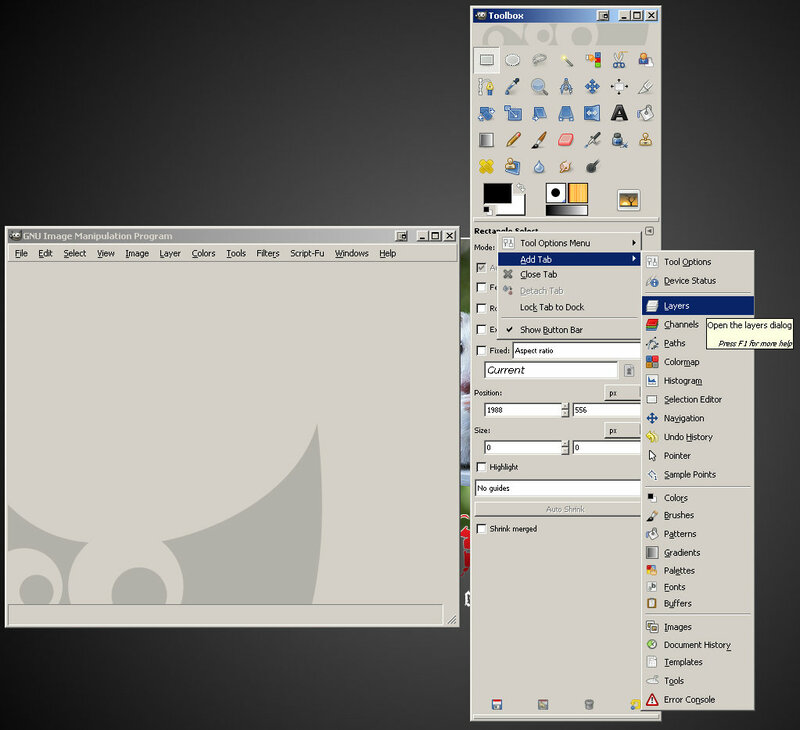 As you see, there are three windows here: the toolbox (upper left), the dock (lower left) and the main window (right). This is the default configuration and we will now change it for our convenience. 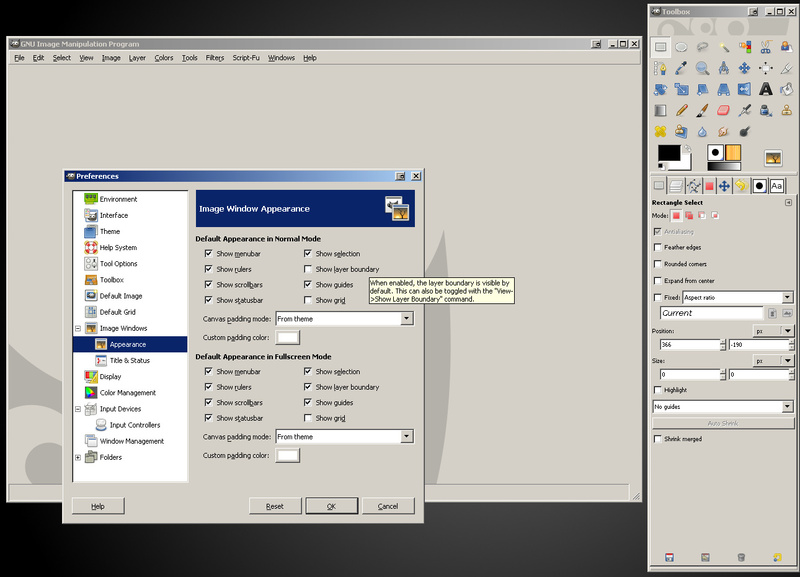 In the window that will open upon clicking “Preferences”, select “Appearance” from the list on the left. The “Image Window Appearance” tab will open. Find the “Show layer boundary” option which should be checked by default, and uncheck it. 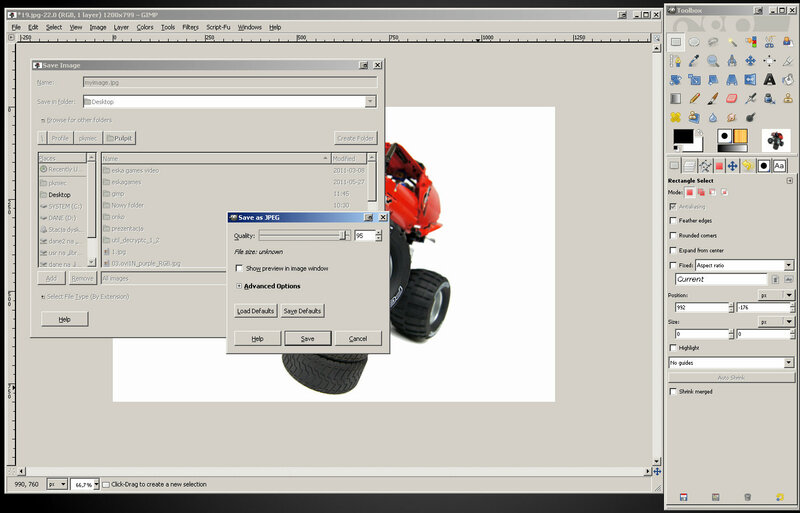 This will deal with the terrible eyesore border displayed around every single image opened in the GIMP. Confirm the change by clicking “OK” button near the lower edge of the “Preferences” window. We are now ready to proceed with photo processing. 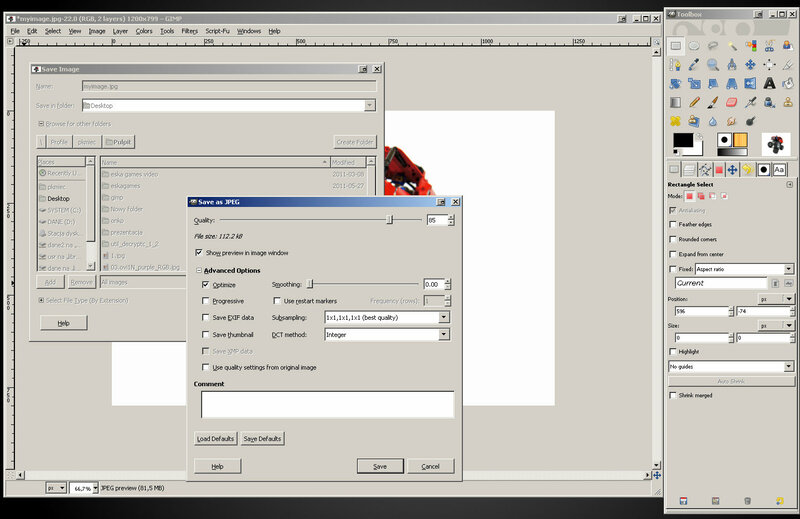 If you want to make sure that GIMP has saved all the changes we’ve made to it so far, just close it (by closing the main window or the toolbox) and launch it again. Now it’s time to open up our first photo. 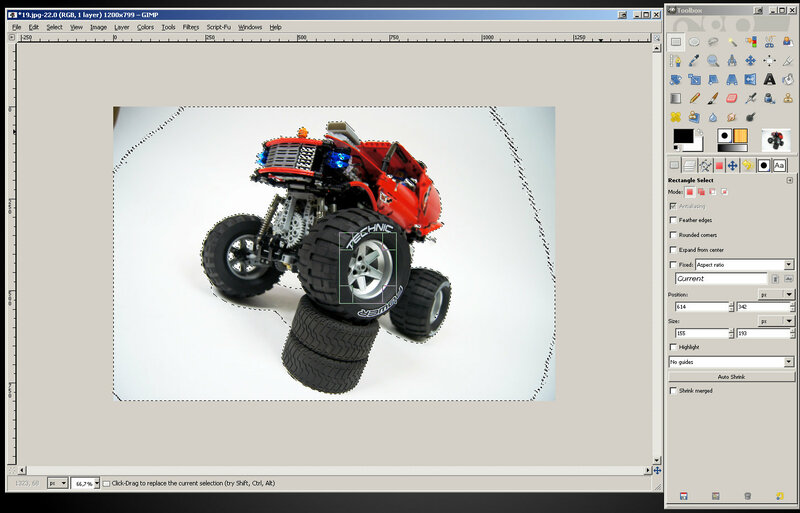 Once a photo is opened, the GIMP will automatically adjust zoom if the photo is larger than your screen. As you see, my photo which is 4592 x 3056 pixels big, was opened at 25% zoom. 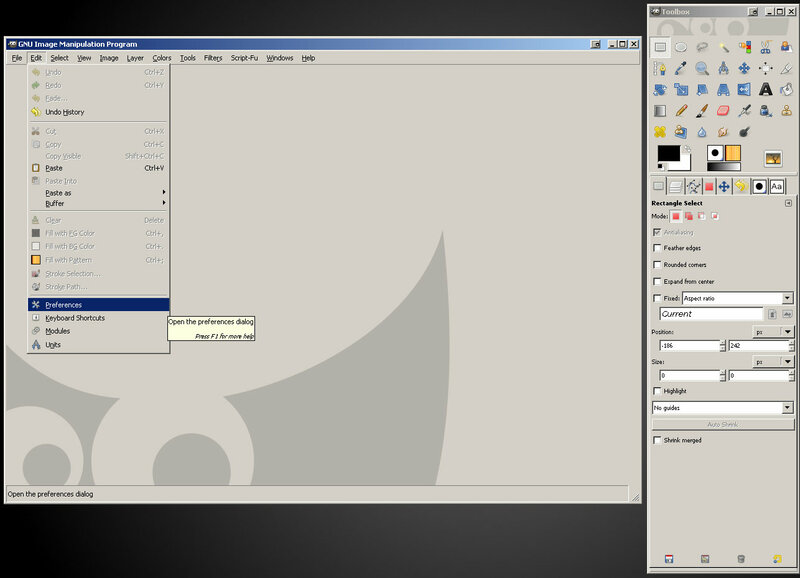 Also note that the GIMP shows the size of the photo on the main window’s title bar. Now, there are two things we’re going to do with the photo: crop and resize. Cropping is simply reducing photo to the desired area only – for instance, the photo you see above has needless empty space on left and right. Resizing is a different thing, and – unlike cropping – pretty much mandatory one. Every photo file has certain size measured in kilobytes (kB) and megabytes (MB): 1MB equals 1,024 kB. This size, which we will call weight to avoid mistaking it with the actual size of the photo (that is its width and height in pixels) is simply the amount of data that describes the content of the file. Since we’re going to publish our photo in the web, its weight should be as small as possible. Heavy photos take long to be viewed through the web, as plenty of data has to be transferred to the viewer. 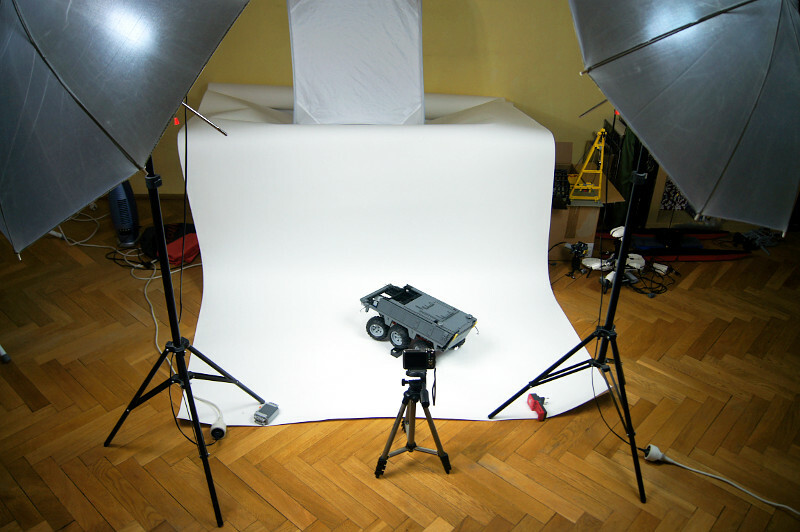 There are several ways to make a photo weight less. We can reduce its quality and we can make the photo smaller – both will reduce the amount of data in our photo file. There is of course a certain limit to both: the photo that has very low quality or is very small will not be attractive to the viewer. 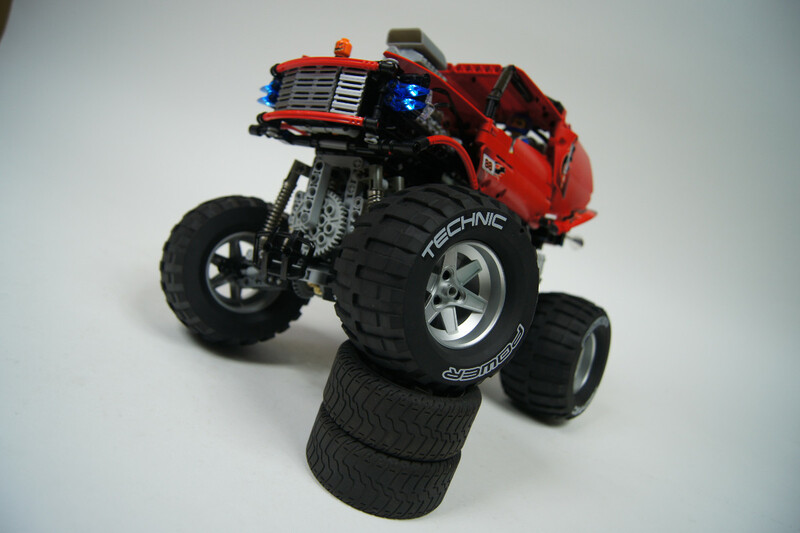 Our goal will be to find a good balance between the quality, size and weight. Publishing photos directly from the camera, in their original sizes, is a terribly bad idea – and one, sadly, still popular among less experienced builders. This is because modern cameras produce photos much larger than modern computer screens can display, and this difference is clearly only going to get bigger. The photo I have opened is 4592 pixels wide and 3056 pixels tall – it was taken at 14 megapixels, the largest size my camera can produce. My computer screen, on the other hand, has 1680 x 1050 resolution, which is fairly high by today’s standards, but it means it’s only 1680 pixels wide and 1050 pixels tall. It means the photo is almost three times bigger that my screen, and I will have to zoom it out to roughly 30% to see all of it on my screen. That, on another hand, means that I’m going to use only 30% of the data I have downloaded in order to view it. That should explain why people really don’t like viewing straight-from-camera photos. Given the size of computer screens that are popular today, I think a 1200 pixels wide photo is large enough. 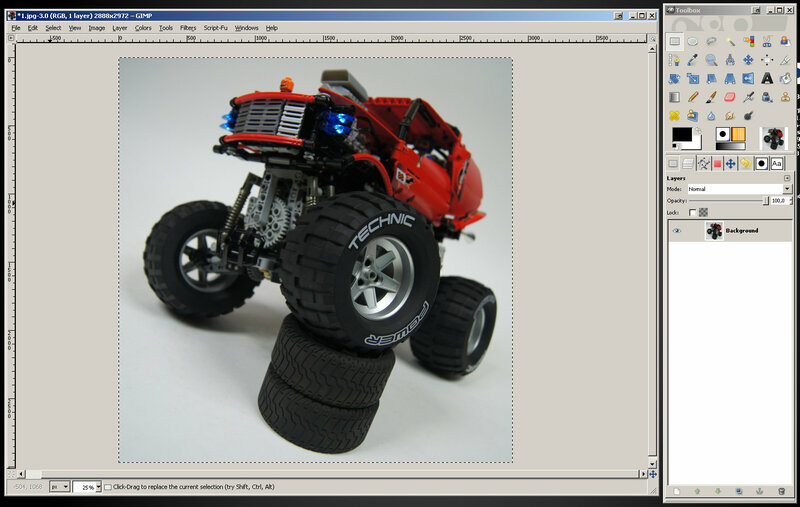 The height can vary depending on the type and position (vertical/horizontal) of the camera that has taken that particular photo, but the 1200 pixels width will be used as a standard in this tutorial. We discussed the size of the photo, and what about its weight? The original photo file taken straight from my camera weights 3.03 MB, that is over 3,000 kB. This is way too much, and much of it is actually redundant data. We are going to make this photo weight less than 200 kB (that’s over 15 times less) and look better at the same time. There is also one more reason why people frown over not-resized photos: the server space. Whenever you upload a file to the web, it is saved on some web server where it takes some space. There is, of course, plenty of free server space to use, but that’s not a reason to upload photos that take over ten times more space than they need to. Reducing the size of our photos 15 times means we can store 15 photos taking the very same amount of space we needed to store one. That’s a good thing for everybody – for viewers who will not be forced to download redundant data to see your photo, and for you as you will need less time to upload your photos and you will need less space to store them – not only in the web, but also on your computer. Let’s sum things up: we are going to crop and resize. Cropping is optional, resizing is mandatory. If we feel our photo needs cropping, e.g. because there’s a lot of useless blank space on it, it is recommended to crop it first and resize it later. Doing things in this order lets us control the size of the photo: cropping reduces the size, so if we resize the photo to our desired 1200 pixels and then crop it, the resulting file will be smaller than 1200 pixels. Let’s assume we decided to crop our photo. We will do it by drawing a rectangle that covers the area of the photo we want to keep and then we will remove everything else. Now, the rectangle represents what we want to keep in the photo, and everything beyond the rectangle is what we want to remove. 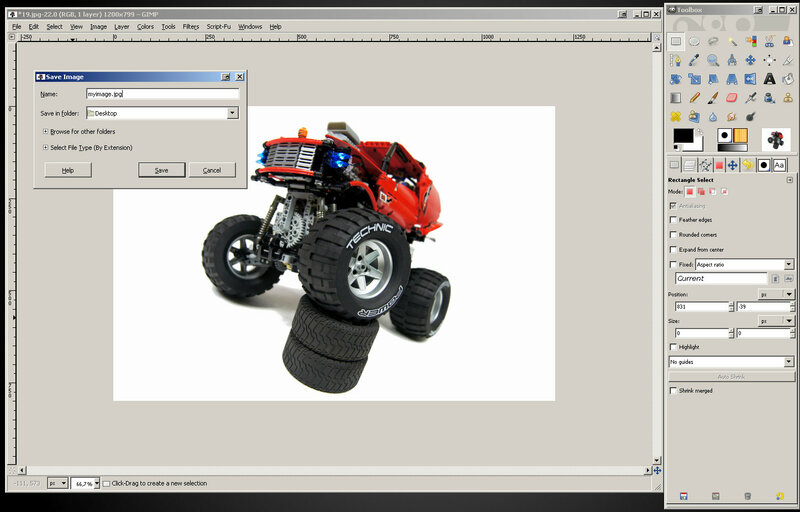 Go to the main window’s menu, click “Image” and select “Crop to Selection”. As you can see, our selection in form of the dashed line rectangle is still active. Let’s get rid of it: to remove a selection click “Select” in the main window’s menu and select “None”, or simply click (with your Rectangle Select Tool active) outside the selection (that means outside the photo in this case). Congratulations – you have successfully cropped your photo. Let’s resize it now. Click “Image” in the main window’s menu and select “Scale Image…”. A new window will open, with a couple of fields. We’re interested in only one: width. As you see, the width of my cropped photo is 2888 pixels. Let’s delete 2888 and type 1200 instead, then confirm with the “Scale” button. 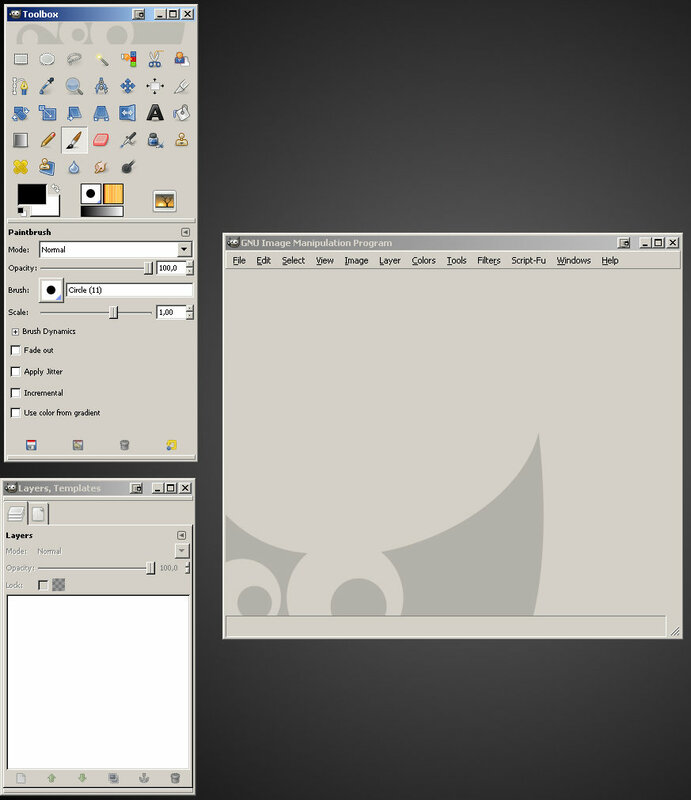 Our photo has been resized: the GIMP’s main window still maintains its size, but the photo takes less space inside it, as the zoom is maintained too. We can zoom in to see it better. Tip: for easy zooming, hold down the Ctrl key and use your mouse wheel. Now that our photo has been resized to smaller size, it has lost some sharpness. Let’s sharpen it up. Click “Filters” in the main window’s menu and select “Enhance” and then “Sharpen…”. A new window will open, this time a very simple one. We need to set sharpness in it, using a slider. We can also use preview to see the result before we apply it, but just like with the rectangle selection, we can still undo sharpening after it has been applied and start over. You see three examples of the same photo after it has been resized to smaller size. Note that the difference between the first two examples: one not sharpened and one sharpened by 18 points, is barely visible, it can be actually unnoticeable for many viewers. That’s how sharpening should be used. The third example, with sharpness set to 90, is very sharp but didn’t turn out too nice. Our photo is now cropped and resized. Time to clean up the colors on it. What we are going to do is to boost contrast, brightness and saturation of colors in the photo. Every camera, no matter how advanced, produces colors that can be manipulated to get a better effect. 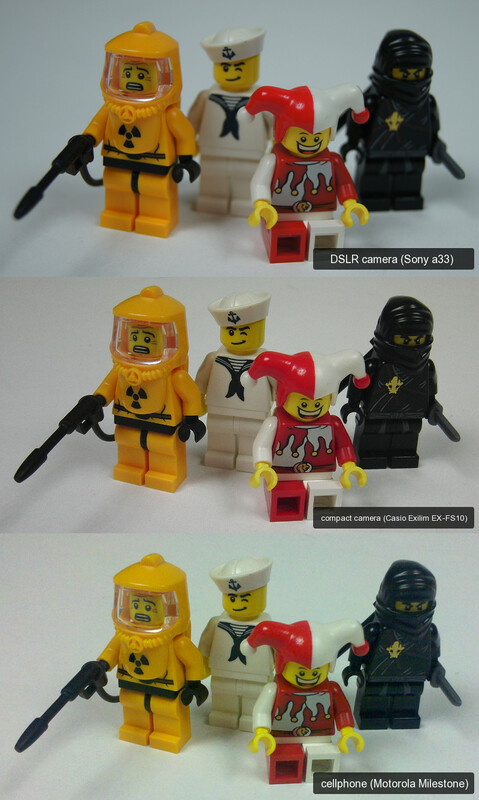 The final effect is obviously best with better cameras, but there is always some improvement possible. Click “Colors” in the main window’s menu and select “Levels…”. A new window will open – it looks complex, but fear not, we’re only here to click two buttons: “Auto” and then “Edit these Settings as Curves”. After you click “Auto”, colors of your photo will get slightly cleaner. This is exactly what we want, and after you click “Edit these Settings as Curves” the Levels window will close and the Curves window will open. As you see, the background on my photo appears purely white now. But we are going to make sure it really is pure white. 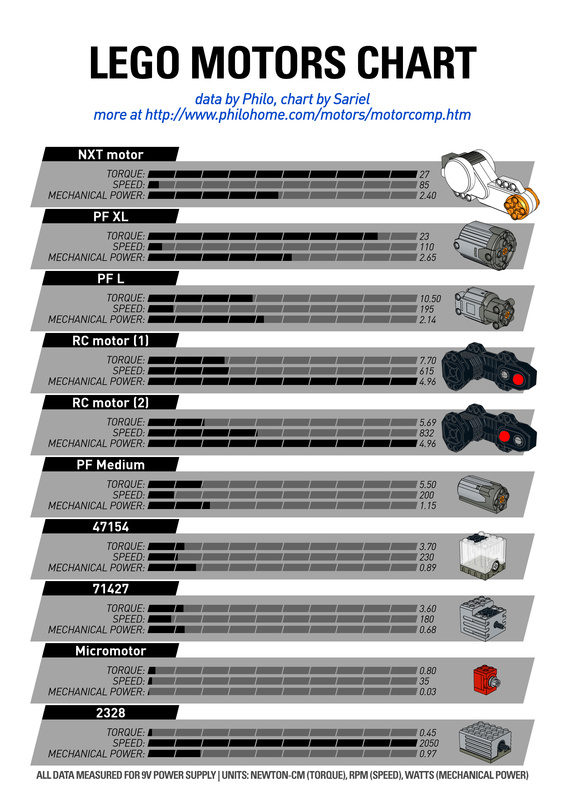 Select the Fuzzy Select Tool from the Toolbox (shortcut key: U). You will see options for this tool on the dock in the lower part of the Toolbox. We just selected the background. The Fuzzy Selection Tool selects the entire adjacent area of a given color – we clicked on white part of the background, so it selected everything that was white. The “Feather edges” option we checked makes sure that the edges of selection are a little blurred – it makes the cleaned background appear more natural than when they are sharp. Another interesting option of this tool is the “Threshold” slider: it controls the tolerance for variations in selected color. Basically, the higher threshold, the greater area gets selected because the tool selects colors of greater variety. With low threshold, you can click some e.g. bright red area and have a dark red area left unselected. With a threshold high enough, all red will be selected. We are now going to cut the background from the photo – the GIMP will automatically replace whatever we cut with pure white color. 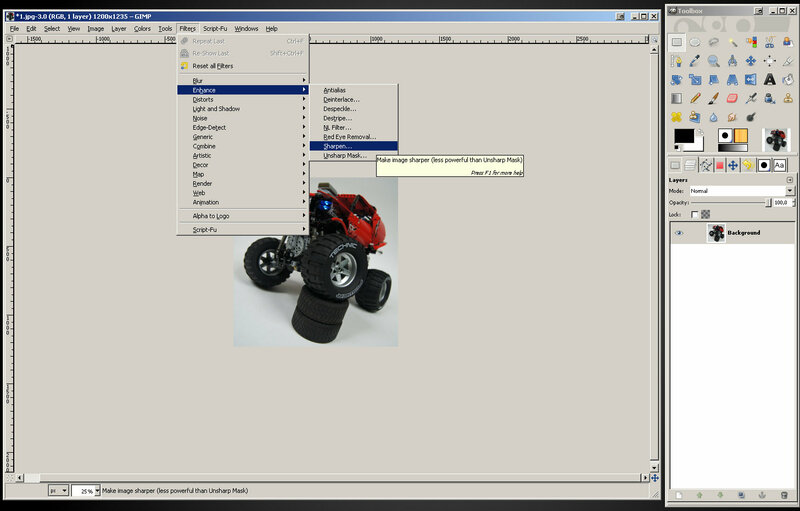 Click “Edit” in the main window’s menu and select “Cut” or use Ctrl and X keys combination. The result should look like this. It’s hard to tell the difference, but it’s there – the object on our photo appears well exposed now, because there is nothing that would distract us from it. You can now remove the selection and enjoy your cleaned photo with boosted colors. What happened here is: I clicked so far from the model that the Fuzzy Selection Tool created selection that is partially away from the model. There are areas on the sides of the model – smaller on right and larger on right – that are left unselected and they will look bad if we cut the background. We don’t want this – we want the selection to close around the model completely. Experiment with where you click and with the “Threshold” value until you get result close to the one from the previous image. It looks very fine already, much better from what we started with. Let’s now take a moment and jack up the color saturation. Click “Colors” in the main window’s menu and select “Hue-Saturation…”. A new window will open, and just like with the Levels window – it looks complex, but we’re interested only in the “Saturation” slider. 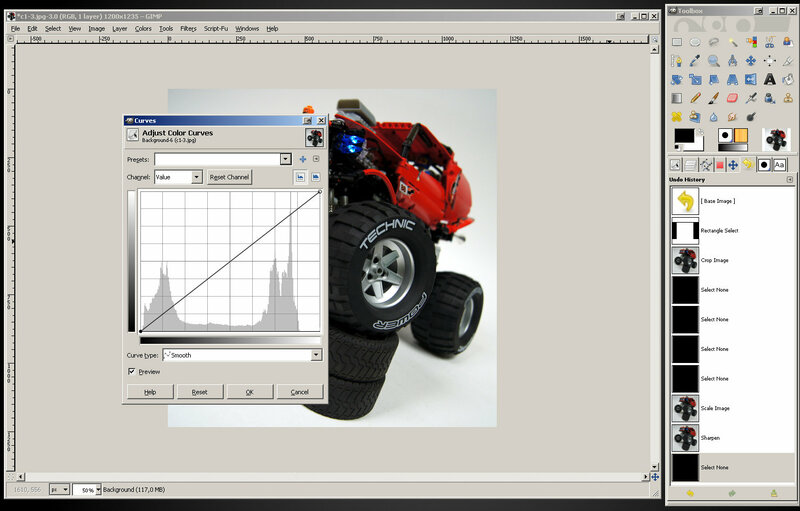 Just like with sharpness, the saturation adjustment can be very useful but it’s easy to use it to excess. You should be sensitive to the difference between colors that are juicy and the colors that are screaming and neon-like. It is also important not to push it too far just because it looks good on our screen, because various screens display colors in various ways. Colors that look good on our screen can look unnatural and over-saturated on another. We can obviously select and cut these places one by one and get a clean white background. However, there are objects that can have tens of places like this, sometimes very small and scattered all around – for example a ship with its rigging. Cutting them one by one would take forever – and this is where we should use Select by Color Tool (shortcut key: Shift + O). The Select by Color Tool works very much like the Fuzzy Select Tool, with one exception: it doesn’t select color just from the adjacent area. Instead, it selects color from the whole picture. If you click red, it will select all red, if you click white, it will select all white – depending on tolerance, which is set just like with the Fuzzy Select Tool. As you see, the Select by Color Tool has selected the background around the objects, the spots where the background shows through the object, but also some very bright areas of the object – in this case the grill and the wheel. Let’s say I was unable to find a setting of the “Threshold” slider that wouldn’t select these areas. So, I will do something different: I will subtract from this selection. Keep in mind that you can subtract any kind of selection, not just the rectangle one. 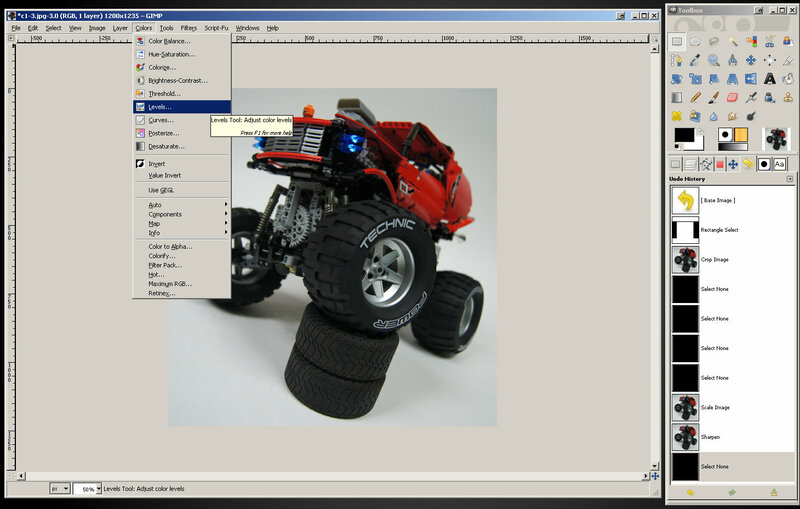 Ellipse Select Tool or Free Select Tool can be subtracted just as well, as long as you hold the Ctrl key while using it. Click “File” in the main window’s menu. There are two options here that we need: “Save” and “Save As”. Here’s the difference: as long as GIMP is running, it remembers what files have been opened with it and how were they saved. 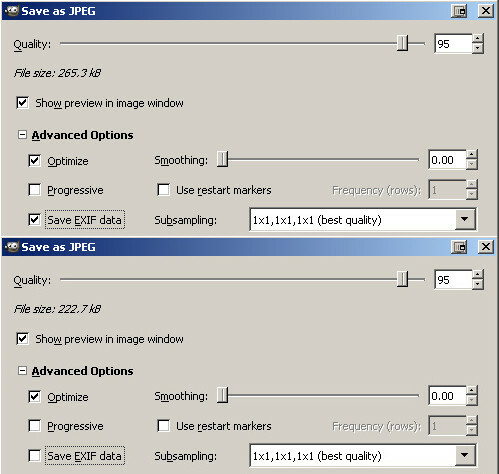 Therefore if you select “Save” for the image that was saved in the GIMP for the first time (or you saved it before, but you restarted GIMP after that), you will get exactly the same options you would get selecting “Save As” (including renaming the file). On the other hand, if the file has been saved with GIMP before, it will be saved using the same settings without giving you any options. Personally, I prefer to use “Save As” options at all times rather than to try to keep track of which files I already did save and which ones I didn’t. This way I can make sure it’s saved exactly with the options I want. As you see, unchecking this option made the photo over 40 kB “lighter” – it weighs over 16% less and its quality remains exactly the same. Finally, let’s adjust the “Quality” slider at the top of the window. You can experiment with it watching how your changes affect the weight of the file and the appearance of the photo (which is previewed with current quality setting). For photos with white background and juicy colors, it’s best to keep this setting at 85 or more. Going over 95, on the other hand, will be in most cases redundant and will not cause any noticeable improvements in quality. Personally, I usually stick to 85 for regular pictures and 90 for pictures that have some text on them. Note that it doesn’t just look better – it also weighs less. I hope this tutorial was helpful to you. 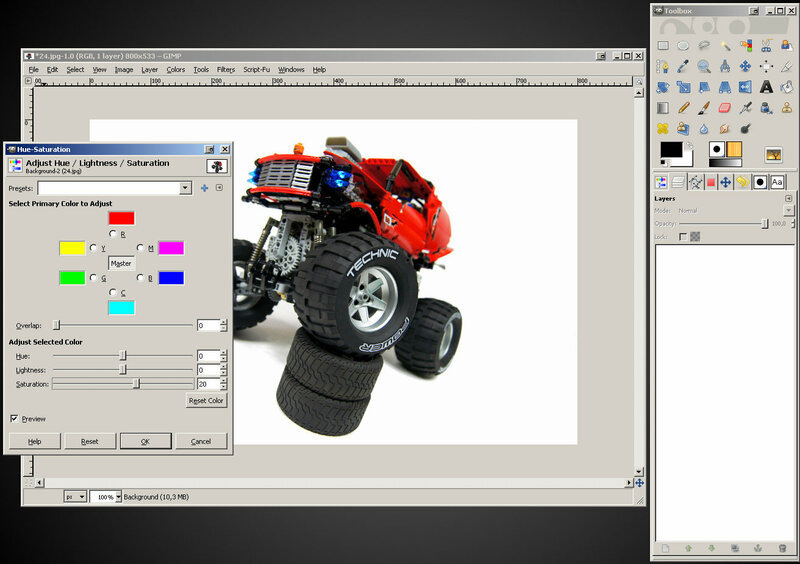 Note that it only covers a fraction of what can be done with the GIMP. Have fun processing your photos. Much thanks for your tutorial! I will use it in my future photos! I don’t have a link, I bought it. Hello Sariel! How can I get the PS14? Do you have a link? Thank you! Thank you so much for providing such a tutorial, Sariel. It is sure to help me a lot! Other than Windows Media Maker I can’t think of anything free. Is there a free editing video studio you would recommend? 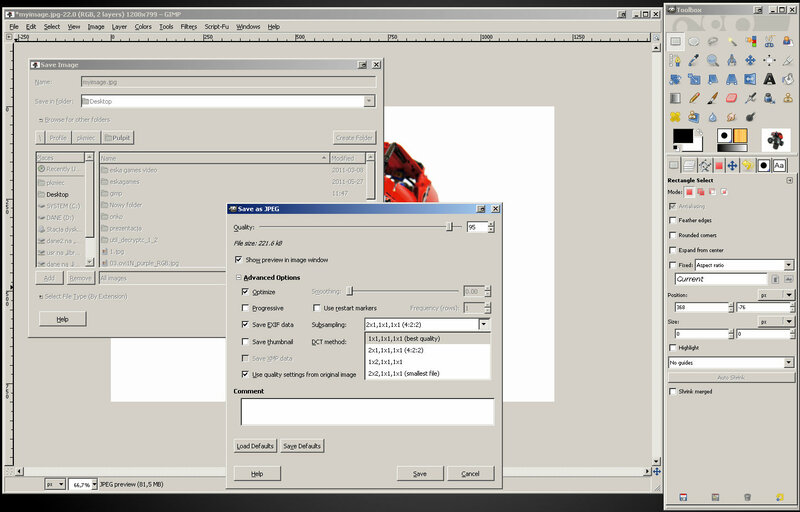 You might want to add that the “save as” option no longer works in the current versions of GIMP, since all non-GIMP file format output has been moved to “export” instead. Thanks for the tutorial, it’s very helpful. Mam specjalne tło do fot, ale tylko jedną żarówkę, więc musiałem się troche w gimpie pobawić. Używasz jakiegoś specjalnego białego tła, czy jest to po prostu zwykły duży papier? What is the font that you used the photo of the hamster? You can do that first, obviously, and the quality should be technically a little better. You certainly have a point here. But from my experience, if you start with a photo shot at 14 megapixels and end with 1200px wide image, there’s little difference. Except that processing 14 megapixels version in any way takes ages, and the final gain in quality is so negligible that I really don’t think it’s worth the effort. Loved this tutorial, I used to do similar things in the past (on different topics though: boardgames and their pieces) with Paint Shop Pro, and it’s good to see where similar options are in the Gimp. I have one question though; in this tutorial you apply the resizing of the picture as one of the first steps, whereas I would expect that it’s best to first make all modifications to colors, shadows, etc. 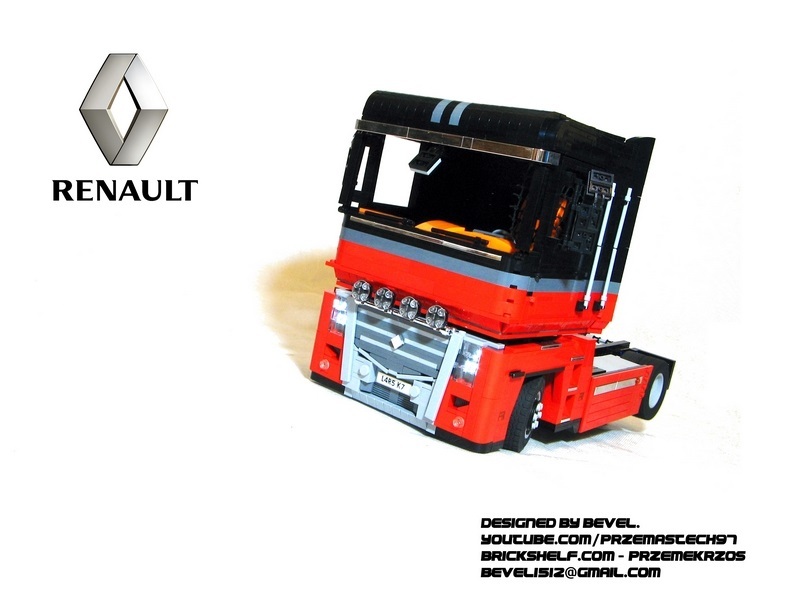 and after that’s completed resize the picture to the smaller format you would use on websites. I can understand editing the sharpness needs to be done after resizing, but I would expect Color manipulation and clearing the background going before resizing, can you explain why you do this early in the process? I think it’s best to look for advice on some photography-related forums. I’m not expert on cameras and I don’t know any of the models you mentioned. Hi. I don’t have a camera for still’s or video and I am eyeing up either the Canon PowerShot A2200 or the Fujifilm Finepix JV200 or something similar. do you have any suggestion’s on what to buy? Very useful turorial , Thank you very much ! I suppose the natural sunlight is a very good solution, if you deal with the fact that it can be sharp and comes from one point only. I have little experience with outdoor photography, so I suggest you look for hints elsewhere. Very nice tutorial. I wonder, for those of us who do not have the budget, if taking photos outside in the late afternoon sun is a good alternative to the studio lights. Also if one was to choose this option, what, if any, considerations need to be taken in regards to this tutorial. Thanks! It was really very helpful. You can check my photo at – http://www.facebook.com/robocasters .I haven’t used Fuzzy Tool in it. Niestety, nie mam na to czasu. Mam małe pytanie. Czy mógł byś zrobić poradnik w wersji PL, lub film na YT? And welcome to the Internet. You can achieve the same effects with the Photoshop, but in a different way. 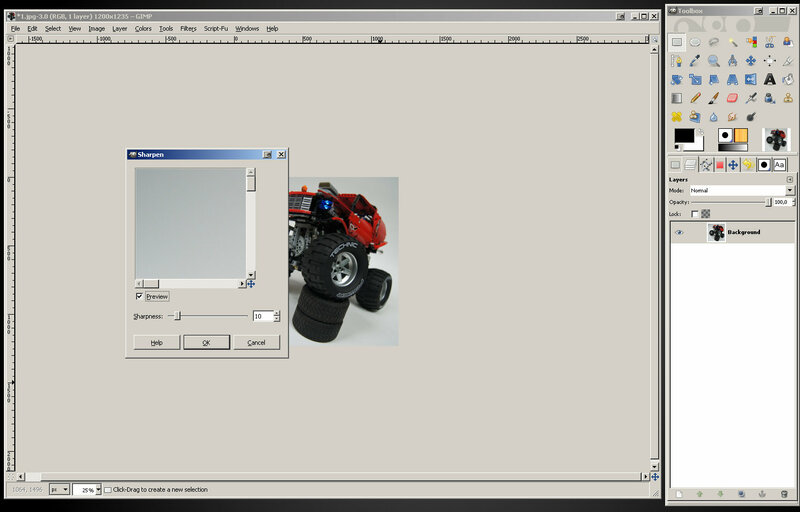 The GIMP and the Photoshop are two different pieces of software. Does it also work with Photoshop CS5.1 Extended?? Where did you get the paper roll?? I’m using Pinnacle Studio 14, there are dozens of tutorials for it. 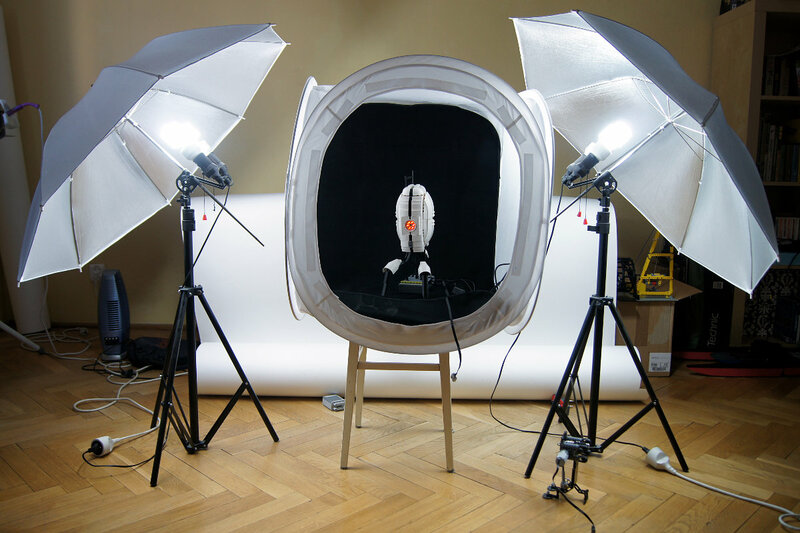 One thing: your lighting setup is quite professional looking, and kinda expensive. Since I don’t really have a budget (being 14) I do the thing you do with paper, but I have a single white lamp. I change my shutter time to about 10 – 15 seconds, and then, while my camera’s taking the photo, I move the light around. That also gives a pretty decent looking white background :). But thanks A LOT for the processing tutorial! I used to just increase the contrast to get a perfect white background; that messed my colors up though. This is MUCH better! Wow thanks for the tutorial!! It really helped me produce way better looking photos! Yes, it is very usefull. Good photo is a good communication. I have tried to make good photos but without white back, it is quite hard to acheive. But I take care about color, saturation and EV. That is a begining ! I wish I had a proffessional equipment like you ! Excellent and helpful tutorial, Paul! Usually my problem is really the lighting and the camera… If they are too bad like they are, usually there not much left to do with Photoshop.